What they grow: Known for their famous locally grown coffee, they also specialize in sweet cherimoyas, dragon fruit, yuzu, blood oranges, and their popular caviar limes. Their coffee quickly sells out, so make sure to arrive early to score this flavorful treat. Where to buy: Tuesday farmers market in downtown Santa Barbara (and hopefully Saturdays for the upcoming holiday season). Additionally, their specialty crops can be purchased on their website. Ruskey also offers educational coffee tours, with sampling encouraged. In season now: Strawberry guava, fresh goji berries, dragon fruit, white sapote, fuyu persimmons, Haas avocados, and pomegranates. Their story: On their 42-acre farm, Good Land Organics has created a sub-tropical wonderland of exotic crops, bringing Central America to the Central Coast. 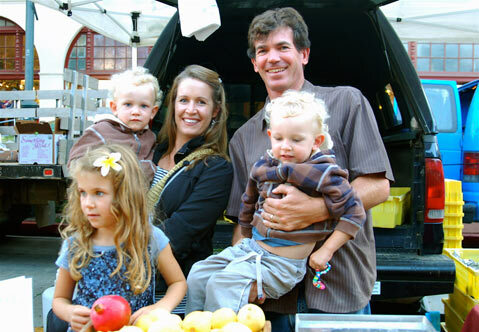 A 12-year veteran of the farmers market, Ruskey is proudly the first farmer to sell local grown coffee in California. The unique ecosystem on the ranch contributes to Ruskey’s ability to grow specialty products others simply cannot. Located at an elevation of 650 feet, Good Land Organics offers a warm, southern orientation for unique crops such as cherimoyas, dragon fruit, white sapotes, and fresh goji berries. Currently, the farm boasts nearly 100 different, organic fruiting plants. An active member of California Rare Fruit Growers and the University California Farm Extension Service, Ruskey is a true innovator in the Good Land. In 2010, he was awarded the innovative “Small Farmer of the Year” award from the University of California. Always experimenting with new crops, Ruskey looks forward to the impending fall and winter season.